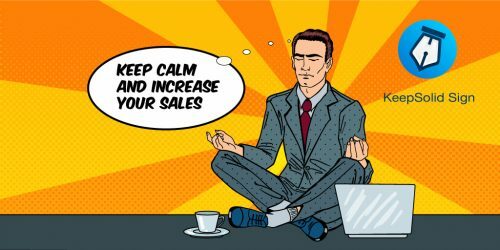 Being a salesperson means communicating with a huge number of the company’s clients, working with a variety of contracts, and striving to increase sales. In order to work effectively and maximize their company’s profit, sales professionals also have to stay up to date with the latest innovations for business in general, and for their profession in particular. Among the top must-have IT solutions for sales teams is electronic signature software. This technology allows salespeople to sign contracts electronically and speed up their deal closure process. This removes the weight of inconvenient and ineffective paperflow from the sales professionals’ already heavy workload. KeepSolid Sign team conducted an extended research to see what are the exact disadvantages of paper workflow for salespeople and how our e-Signature solution can help them in their everyday work. To top it off, we have interviewed our clients and reviewed the real cases. Let’s check them out! Low productivity. Working with paper-based workflow takes too much time. One day, you have to print a document, sign it, scan, send it to your client, and wait until they sign it back. The other day, you have to meet with your customer and close the deal in person. This is unproductive, as in the first case you can wait indefinitely, and in the second case your meeting can be scheduled much later than you need it. Such delays can even end up in the deal getting cancelled. Legal problems. You know the drill – you or your partner make some sort of mistake in a contract. It can be everything: from sending an outdated version to missing an important piece of information. Unfortunately, such a mistake can go undetected until the document containing it is about to come into force. And as the icing on the cake, you’ll have to resign the contract (see the previous point). Lack of visibility. It’s not easy to track the current status of your paper contracts. You can’t be sure if it is already signed or if your client has forgotten about it altogether. The only thing you can do is wait until you receive the email from your client. Unsatisfied customers. The whole process of paper-based signing is stressful not only for you. Manual reviewing and signing can also be a real headache for your clients. Mistakes or skipped fields in the contract can lead to a client’s frustration and cause difficulties in your future cooperation. It speeds up the sales process. As GetAccept research puts it, 58% of all documents can be signed in less than 24 hours with an e-Signature solution. Moreover, 44% of those are signed within an hour. You don’t have to wait weeks for your client to allocate time for printing and signing the contract, or for meeting with you. The closing occurs in real-time. It reduces legal risks. With KeepSolid Sign, you can correct your document right in the app, with a clear version history available for you to be prepared for any auditing. Also, you can annotate signers and add fields for their signatures. Thanks to helpful tips, your client will always know where they have to sign their document and won’t miss any parts. It provides sales teams with real-time document tracking. One more useful feature of KeepSolid Sign is clear document status tracking and notifications about changes. You can see in real time if your client has signed the contract. Our solution for sales teams features 5 different statuses: draft, processing, waiting (waiting for me), completed, and archived. In the end, you will get status notifications and know when your deal is closed. KeepSolid Sign is a perfect solution for sales professionals to close their deals from anywhere in the world. Moreover, to sign the contract your clients don’t even have to register in our app. They will receive the email with a link and upon following it, they will be able to sign your contract right on their device. That’s it for today! We hope that this article was useful for you and you’ve learned how to improve sales with an e-Signature solution. KeepSolid Sign is suitable for any sales teams in any organization, so why don’t you start your e-Signing with our 14-day free trial? Get it now and boost your profits! How to Keep Your Business Safe From Scammers?